Other than the first episode of Retail Review, I have only gotten 'from the factory' blasters by Upper Deck and Panini. This week I'm returning to the re-pack type product I started with. In episode 1, I got a re-pack of 12 different packs in a plastic container. Here, we have the same company packing the cards in a very different form, but at the same price - $9.99. I have to admit, I did not have a very good feeling about this product when I bought it. Did my instincts prove correct? We're about to find out. 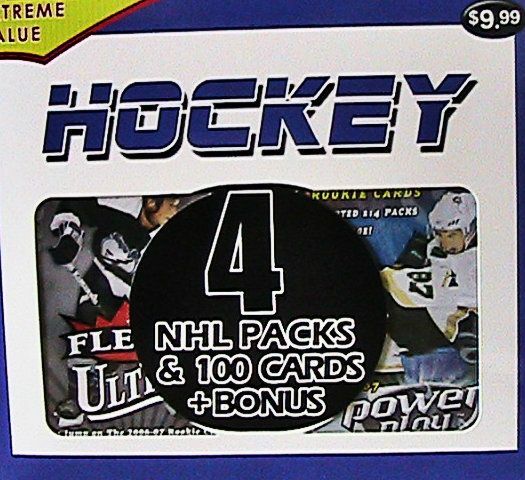 06/07 Ultra, 06/07 UD PowerPlay, 07/08 Hot Prospects, 07/08 Upper Deck Series 1, 02/03 Be a Player, 100 loose cards in a cardboard box. I saw this product on the shelves at the Target with the same type of re-pack of baseball, football, and basketball. I also saw the 12 pack version still on the shelves as well. Since I had already done one of those boxes, I decided to at least try something different before I returned to that. Immediately I was skeptical of what could be inside. The box says that there are 4 packs of cards. Looking around the box I could clearly see what the 4 packs were. These packs were of the same ilk as the 12 pack re-pack. So in other words - not very good. Also within were 100 unknown cards and a bonus. In my thinking, I could not see how there could be any type of card worth having in the 100 lose cards included. If I were to pack a box of this stuff, I would be darned sure not to include anything of significance within. So, knowing that was in there instantly made the box a bit sketchy for me. The only other thing in the box was the 'bonus'. What on earth could that be? Would it be a free hit like a jersey or autographed card? A graded card? Of course not! It was another cheap pack of cards. VIDEO NOTE: I missed the pack of Hot Prospects when filming. 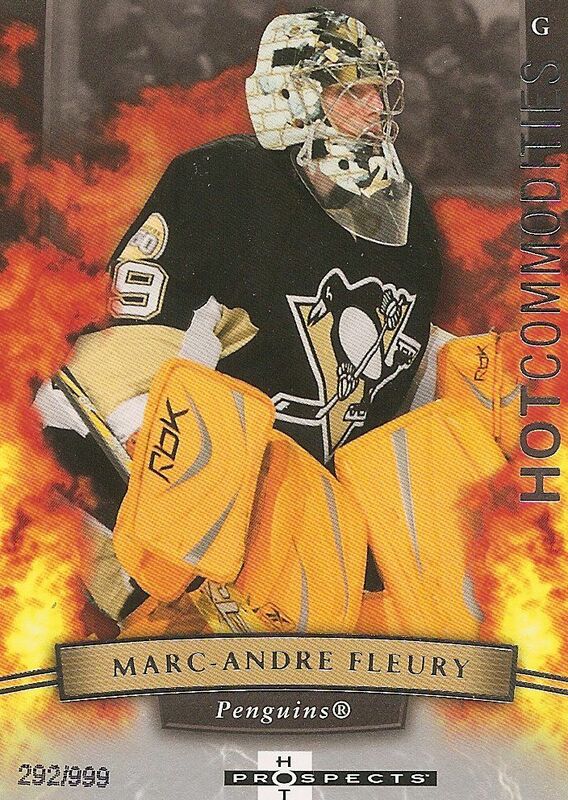 Included in that pack were 4 cards: Jaromir Jagr, Saku Koivu, and Vesa Toskala base as well as a Marc-Andre Fleury Hot Commodities card/999. The 100 loose cards I got were at best... mildly interesting and at worst... absolutely horrible. When I say horrible, I really mean that! Included within the 100 cards were overproduced and poorly designed Score, Pro Set, and Bowman cards from 20 years ago. 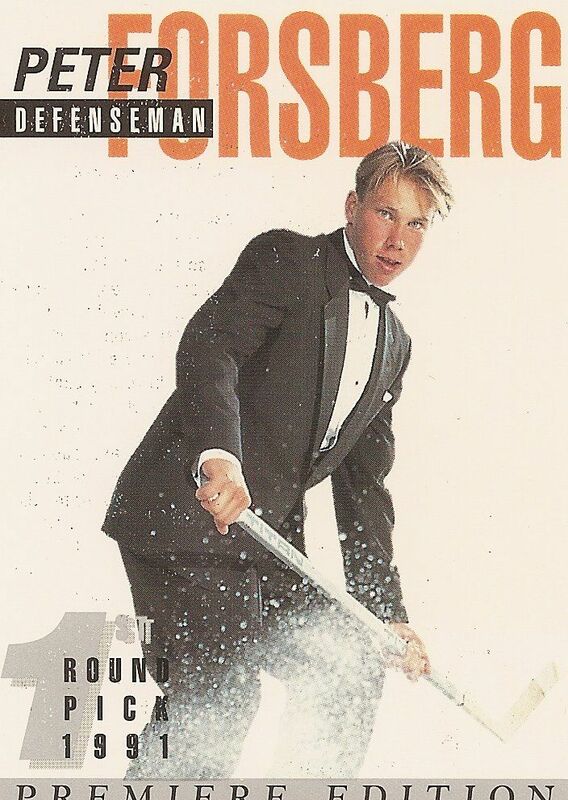 Flipping through the old cards was boring for the most part. Seeing a lot of no-name base definitely made me question why I bought the box. There were a few cards I did enjoy seeing though. Some cards brought back memories of when I collected back in the 90's, especially the Leaf base card. Those were definitely fun times in collecting, and I remembered those days fondly. I guess if you were a person just getting back into collecting after a long time out, this type of re-pack could bring back some good memories and possibly spur you on into getting some newer products. In terms of the packs, there was really nothing that great. I was able to, for the first time in a re-pack, get a Young Gun. Unfortunately it was of Tyler Weiman, someone I had not ever heard of before. In the Hot Prospects pack I did get a serial numbered card - which was a little surprising, but again, nothing to write home about. The biggest bummer with the packs came with the 'bonus' within the box. My bonus was a pack of 02/03 Be a Player. The pack had a giant $1.59 sticker on it (nice.) and when I opened it, the cards were stuck together. After prying them apart I could see that the gloss they used had stuck on the fronts of the cards as a white sandy substance. Classy. It was difficult to choose 3 gems from this break, but I did. Here are my three favorite cards from my Extreme Value Hockey box. This card surprised me when I first saw it when going through the 100 card stack. I knew that Upper Deck had used photo editing and enhancements in their products, but forgot that Score had done some of their own as well. 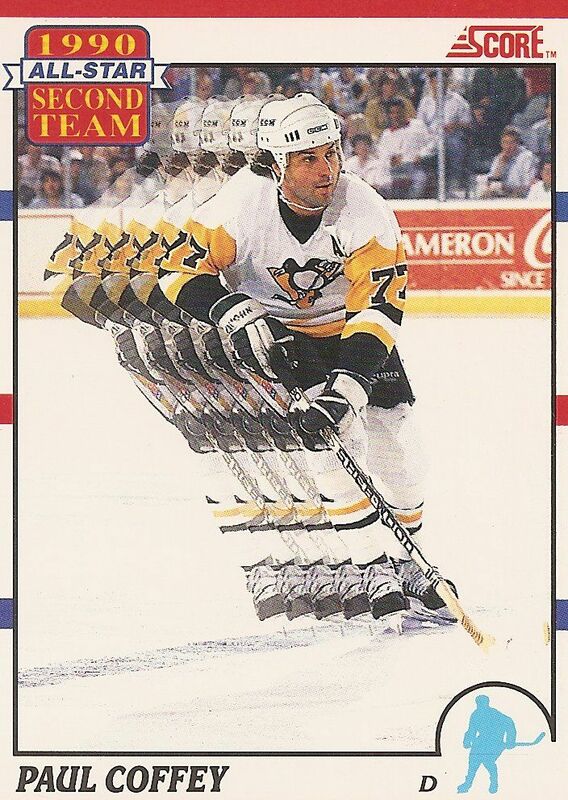 This Score Paul Coffey card just looks cool to me. The effect on the photograph gives the image a sense of motion that sets it far apart from the boring photographs used on so many cards in this era. This insert card is probably the most vibrant and colorful card that I received in the entire box. Obviously, being a more modern card amongst a bunch of older ones it would be. But even along with other modern cards, this one is visually very appealing. The flames and fire obviously match the 'Hot Commodities' name, and being serial numbered to 999 is something that elevates the card as well. For about ten bucks you get this re-pack at Target. I would have to say if you see it, skip it. It sort of works out to about $2 per pack and a 100 lose cards. The 100 lose cards is the thing that kills the deal for me. It's going to be mostly junk that you just won't know what to do with. For a better value I would take my chances with a 12 pack re-pack for the same price. There you have a one in a million shot of something good rather than one in a zillion here with this product. Let me know what you thought of my Extreme Value box down in the comments below. Have you ever gotten anything good from one of these things? I'd love to know! Target has a re-pack with 4 packs and a set of 2010-11 Score Rookies and traded with a guarantee of 2 autos. One will come from the Score box set and the other from a pack of 90s-era Be a Player, which was a 1-auto-per pack product. I ended up getting a Chris Chelios auto out of BAP. i have never gotten anything good out of those boxes that why i saty away from them now.there is no real value in those i find just a bunch of 1 cent each 90's cards if that.great reviews best thing to watch on sundays really like them dont stop. thanks! i'll definitely keep these going!